Happy Meal changed things up at the last second and went with the pizza, and that left me holding the bag. Happy Meal's burger radar is damn good--I should have had the pizza, too. I soldiered on and ordered the $11 Stanley's Burger, which came with both cabbage salad (coleslaw) and fries. I ordered my "Certified Angus beef" cheeseburger Medium. Apologies for the yellow-tinted photos. It was dark, and all I had was an LED light with a napkin to cut the glare. 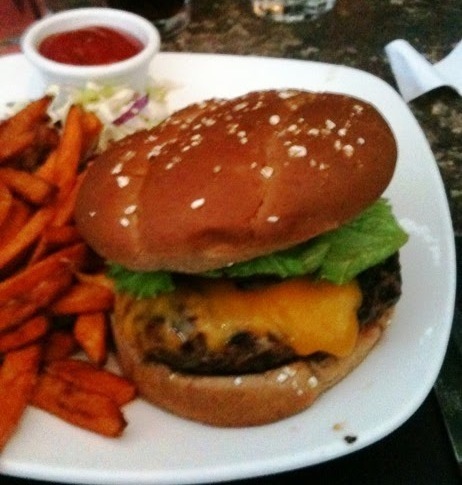 Frankly, it doesn't really matter--there is no need for anyone to have this burger. The Beef: This was a pre-formed, medium ground, flat disk of Chuck. It was Angus, and that was all the waiter knew about it. The beef was firmly neutral. Since it was aggressively over-cooked, I expected some flavor to come out of the collagen, but in spite of the lack of care on the grill, the burger had ZERO beefiness. There was not even a hint of aging to provide a front note. It was just bland and uninteresting. The Sear: Meh. 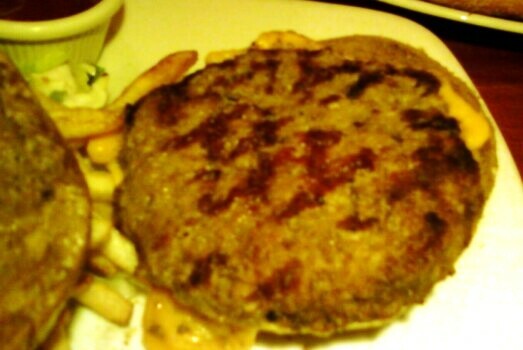 They tossed the puck of Chuck onto a not-hot-enough grill, which got some spotty, half-hearted grill marks on the patty. The Seasoning: There was no seasoning. I repeat....there was NO seasoning. The Preparation: My cheeseburger at Stanley's Restaurant was cooked to a bland Well-Done in spite of my request for Medium. In spite of the poor quality of the pictures, it should be easy to see that the color of the interior of the burger matched the color of the whole wheat bun. Unless, one is fighting an E.coli epidemic, there is simply no reason to cook a burger this hard. The Cheese: A wonderfully gooey yet completely insipid, mild Cheddar. It would have been great had it been salty and sharp--it was not great. 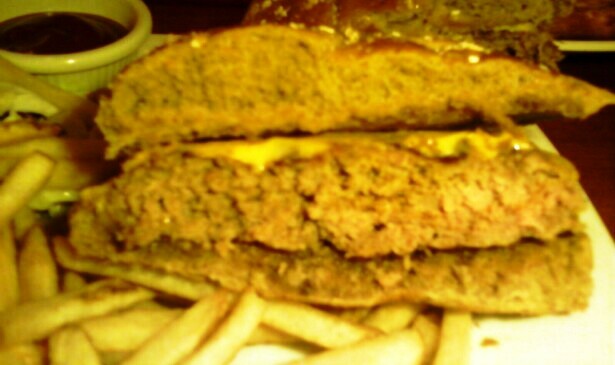 The Bun: A barely toasted, moist, whole wheat, burger bun with a sprinkling of oats on top. The bun was fine. The bun was the best thing about the dish--the bun was merely fine. Meat to Bun Ratio: I only had three bites of this uninteresting burger, but the meat to bun ratio was just right. The Fires: Unseasoned, slack, and lukewarm. I tried three of the limp, bland sticks of disappointment, and I gave up. Oh, the slaw was warm...warm coleslaw......yech. The Value: The value would have been awful had I been required to pay 11 bucks for a burger that I sent back after 3 bites. In fairness, the burger was comped. I sent it back with my waiter after I explained that it was bland and over-cooked. I tried a slice of Happy Meal's pizza. The pepperoni slices were thick and satisfying. The other dishes coming out of the kitchen looked fine. Perhaps Stanley's Restaurant would be a great spot for cuisine other than burgers. Burger Review : Bland, over-cooked, and under-seasoned burgers can be found at Stanley's.